Story: Is it true that - If something tastes really good it must not be "healthy"? I don't know.. This recipe is quite tasty and it doesn't appear to be unhealthy.. but then.. who am I to say what is healthy and what is not. Just reading this blog can tell you how conscious I am about my calorie intake ;-) Also, people don't seem to agree on what is "healthy" - e.g. Is spinach a good source of iron? Anyways .. back to this recipe.. I like baby spinach in my salad and I love fruits. 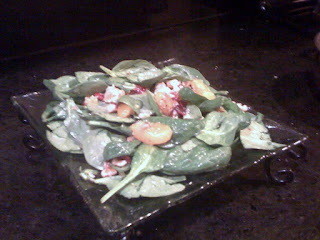 I got inspired from the Apple-Goat Cheese salad recipe that Rupangi gave me and came up with a variation suitable for summer. 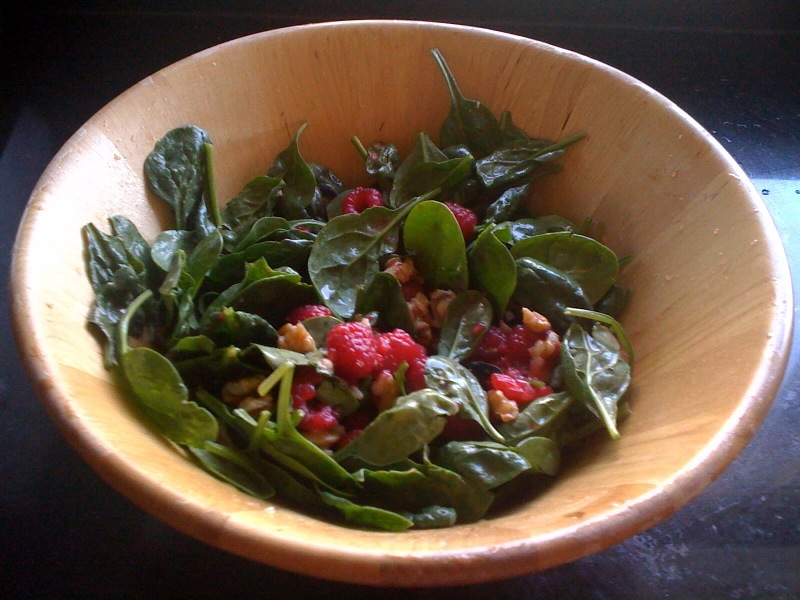 Mix the red wine vinegar and raspberry dressing before adding to the salad. Add rest of the ingredients to a salad bowl, add the dressing and mix lightly without breaking the fruit. Goes very well with BBQ food. This is a very healthy and easy-to-cook spinach salad for summer! Thanks for the recipe!